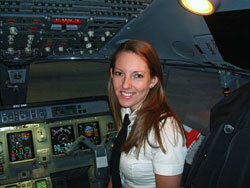 I just read this month’s edition of Flight Training Magazine that featured an article about First Officer Lindsay Burns. Lindsay is a very talented young lady who was a flight attendant for Continental Airlines when she decided that she was more cut out for the work inside the cockpit rather than in the back. After doing her due diligence about how to make the transition to the front of the aircraft, Lindsay enrolled at ATP for her flight training. She earned her Private Pilots License within sixty days, and then went on to earn her Multi-Engine Rating, Commercial Certificates, CFI, CFII and MEI in just 90 more days in the Airline Career Pilot Program offered by ATP. Lindsey then began to instruct for ATP in our Jacksonville Florida Flight Training Center, earning the respect of her students and logging up to 80 hours of flight time per month. Once she had enough hours in her log book, she enrolled in ATP’s Regional Jet Program where I had the pleasure of instructing her. Shortly after completing the RJ Program, ATP helped her get an interview with ASA/ExpressJet and she was hired into the right seat of an Embraer Regional Jet where she is flying now. In her own words: “When I first considered taking flight lessons in February of 2010, in hopes it might eventually lead to a flying job, I was skeptical and not entirely convinced it was possible to go from zero time to a regional airline in a year and a half. However, here I am enjoying the view out the front of a jet from 36,000 feet, and I am absolutely loving my new career. I can’t help but smile every time I take my place on the flight deck, and I can’t imagine doing anything else. As Pete Bidell, the Airline Pilot and author of the article about Lindsey, said in the article: “To make it happen, Burns basically put the rest of her life on hold and attacked flight training with all her time and effort. She initially took a voluntary leave of absence from her flight attendant job, which meant no pay or benefits—something not for the faint of heart. ← Age 65 Retirements Begin Soon, How Will That Affect the Airlines?